If you are going to be intellectually honest, you have to consider what your opponent thinks and believes and why. I do not want Obama to win, because I love my country too much to see it continue on the destructive path he has set for it. But if you want Obama to take that long ride back home to Chicago in January of 2013, you need to think what it would take for him win, so that you can prepare and counter his actions. The electoral landscape is not looking good for him right now. There is a 50-50 chance that we will enter into a double dip recession and no president has ever won reelection with unemployment above 8.2% for more than 70 years. Of course, no black man has ever won the presidency before either, so that tidbit is not necessarily governing but does provide guidance to be considered. With a poor economy, Obama can continue to blame Bush, but that story is wearing quite thin. The probability of a sudden economic expansion is highly unlikely, unless there is a complete reversal of economic policies. So that aspect is not one that he is likely to emphasize, and would prefer to ignore it if at all possible. It is further unlikely that Obama has the mental agility to even grasp how ineffective his policies are, so the chances of even recognizing that they don't work means that Obama will continue on straight ahead, heedless of the facts. Obama is striving for a billion dollar campaign goal, and that is not necessarily unreachable, although a lot of the corporate bundlers who supported him before are unlikely to continue to do so this time around because he can't please all the big donors. Obama does have the fullthroated and unquestioning support of the Mains Stream Media, but their influence is also wearing thin as people come to realize that they are not honest brokers, but rather future Press Secretary wannabes. Alternative sources of information and commentary are taking over all but the most unsophisticated voters, and they will remain steadfastly loyal to the President if for no other reason than their unthinking hatred of the Republicans. Electorally, Obama is still popular with 16 states, and certainly has the unthinking support of the 20% of the population that call themselves liberal, and that of the African American community as well. That base, assuming they don't stay at home out of disappointment, will account for 30% of the vote so he just needs to pull in another 21%. That is going to be difficult, unless the Republicans pull another weak candidate like McCain. All of this seems rather pessimistic for getting Obama reelected, but there are two possibilities that can allow him to slip back into the Oval Office. First, the aforementioned Republicans pick the absolute worst candidate to run against him. At the moment, the generic Republican is beating him, but once the nomination is made, you can bet that all the political organs of the Democrat party will be mobilized to demonize his opponent. Doesn't have to be fair or accurate in the attacks, but if they are valid that will certainly help. The other road to electoral success is the same one that Clinton used: A third party candidate that strips voters away from Obamas's opponent. Like 1996's Ross Perot, the third party candidate needs to be independently wealthy, have a certain level of charisma and the organization to get his name on the ballot. Dodnald Trump would certainly fill the bill plus he has the ego to try and make it happen. But I don't think that Trump will pull enough votes away to assure Obama's reelection. There may be a better candidate in Ron Paul. While he doesn't have the money of a trump, he does have the fanatical support of his followers who would vote against Obama if there is no other choice, but will abandon the Republican if Paul runs on the Libertarian ticket. So in the final analysis, Obama can do little to ensure his reelection. It will almost assuredly come down to a third party candidate that is strong enough to pull more than 20% of the vote. Not that it can't be done, but it sure doesn't look good. I have long looked at groups like National Organization for Women and others as tax exempt shills for the Democrats in that they are so blatantly one sided. 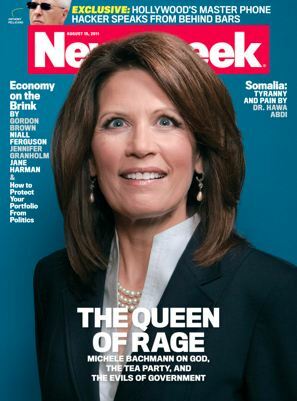 Remember how NOW came to the aid of Sarah Palin? Neither do I. But when they do the right thing, you should acknowledge it and in turn, they earn greater respect for doing the right thing. The example today is Newsweek and their cover showing Michelle Bachmann over the title "Queen of Rage." This is just playing into the stereotype of women being "hysterical" while men are cool, calm and collected. Just like old Barry Obama who has been having tantrums because no one listens to him anymore. But good for NOW! (pardon the pun) for doing the right thing. Why the hate by the Left? Could it be that they have run out of ideas? Dave Budge has a post on Electric City that points out that assigning blame does nothing to solve our economic problems. I had posted a comment in that regard which led Rob Kailey of Wulfgar fame to respond. I answered parts of his comment there, but it really requires a more in depth look that would take over the post. For that reason I have moved my response to this post. I am not aware on any basis for his assertion, except for wishful thinking. I am sure that the same old tactic will be invoked, that I should Google the assertion for myself, but since it defies even common sense, I won't bother. Let's apply common sense to the problem though, and see if raising taxes on the rich results in higher unemployment is an invalid assertion. Suppose I own a company with 100 employees and my taxes are raised 5%. I have several options, raise prices, which makes my business less competitive, equally pass the costs onto all the employees or absorb the costs on my own. The first will probably result in less profits for the business as consumers seek other alternatives. The second would require an equal cut for the pay of all of the workers. How many of us are willing to take a pay cut at all? We become accustomed to our pay, and a cut is not acceptable. On the other hand, I could also reduce the workforce by 5%, which is the opposite of Wulfgar's hypothesis. The same applies if I absorb all the costs. If my spending power is reduced by 5%, that means I get to buy 5% less. That results in other businesses getting 5% less, and since they also are hit by the tax increase, it magnifies the impact of the tax raise, and we all lose. So that "zombie lie" is proven to be an actual problem that cannot be dismissed out of hand. Nor are our economic woes the fault of “entitlements”. That is simply another way to place “blame” while masking the fact that you’re doing it. I work, then I get paid. That’s the agreement between myself and my employer. If my employer finds himself without the money to pay me, that’s not my fault. I’m not “entitled” to my pay. It was an agreement, a contract. It was a deal. I am not sure of the point of this statement. If Rob is entitled to the pay (as he should be) and there is no money to pay for it, Rob could sue to enforce the contract, but if there is no money in the business, Rob would prevail but to no ultimate end if the employer is bankrupt. If the contract is unenforceable, there is no real contract. But to ignore problem with the growth in entitlement spending is childish at best and wishful at worst. Social Security, Medicare and Medicaid along with interest on the debt already occupy more than half the total federal budge. Yes, the workers were promised the entitlements, but if there is no money to pay them, it is an unenforceable contract. The thinking on the Left seems to be "tax the rich" as a solution, but as has already been noted elsewhere, taking all of the money earned by those making a million or more will not even cover the deficit, much less the debt, and who will you tax the next year when all those taxed fail to show up for work? The rest of his comment in this paragraph seems to be a non-sequiter, so it is impossible to respond. Rob's next point seems to be that the analogy of paying the debt to personal finance justifies raising taxes. Since it seems to the rage among many on the right to compare governmental finance with a home budget, allow me a generalized anecdote. Every single time in my life I’ve found myself owing what I couldn’t pay, I’ve used a vast array of methods to keep afloat. I’ve done the severe austerity. I’ve not paid one bill so that I could pay another (robbing Peter to pay Paul). I’ve sold assets. I’ve borrowed on assets which only pushes the pain forward. I’ve used legal means to forestall the debt. The one thing that’s been consistent throughout is that my troubles, such as they are, have only been solved by an increase in revenue. Applying his argument, the government should first cut spending. Hooray, a wonderful idea. No more dinners out, and yes we will need to eat Top Ramen for a long while until we get spending under control. I agree that we need to look at what we are spending money on and whether we can do without it. Cut all subsidies, corn, cotton, sugar, peanuts, milk, crop rotation, and alternative energy as well. Make them function in an open market, and if they can't survive, they don't need to be propped up either. So we are in agreement there. His next point about not paying one bill to pay another is a short term solution but only increases the problem as the bill not paid accrues interest and late fees, not to mention the failure of a moral obligation to pay just debts. So that won't work. Selling assets that you can part with is a good idea as well. For instance, Montanans receive more in federal spending than they pay in. A good part of this is because the feds own about a quarter of the state. Start selling forest service lands and you get the double benefit of cash and reduced costs to maintain it. That also seems like a good idea. He mentions borrowing on assets and correctly acknowledges that only pushes the problem forward. Just like we are doing now with our continued federal borrowing. So again we are in agreement, even though he may not have intended it. Lastly, he reports that the only way to solve the problem is to increase revenue. You can go to your employer for a raise, but if he doesn't have the money to pay for it, what are you going to do, take a second job? Is he suggesting that the US take a second job? As far as tax cuts are concerned, Bush did indeed cut taxes for the wealthy -- along with everybody else who paid income taxes. But does Brown remember that tax revenues actually increased in the years after the Bush tax cuts took effect? Revenues fell in Bush's first two years because of a combination of the tech bust and the start of the tax cuts. But then things took off. After taking in $1.782 trillion in tax revenues in 2003, the government collected $1.88 trillion in 2004; $2.153 trillion in 2005; $2.406 trillion in 2006; and $2.567 trillion in 2007, according to figures compiled by the Office of Management and Budget. That's a 44 percent increase from 2003 to 2007. (Revenues slid downward a bit in 2008, and a lot in 2009, when the financial crisis sent the economy into a tailspin.) "Everybody talks about how much the Bush tax cuts 'cost,'" says one GOP strategist. "We're saying, no, they led to a huge increase in revenue." And deficits shrank. After beginning with a Clinton-era surplus in 2001, the Bush administration ran up deficits of $158 billion in 2002; $378 billion in 2003; and $413 billion in 2004. Then, with revenues pouring in, the deficits began to fall: $318 billion in 2005; $248 billion in 2006; and $161 billion in 2007. That 2007 deficit, with the tax cuts in effect, was one-tenth of today's $1.6 trillion deficit. The problem with the tax cuts adding to the debt, was that we cut taxes, and increased spending. Government spending goes up every year, and in the last two years has exploded. Tax cuts allow the private sector to more effectively use the money than the government. I realize that Wulfgar is not alone in his thinking on economic matters, but the desire to believe that raising taxes is going to solve the problem is itself a "zombie lie" and it's time to kill it once and for all time. This is called The Macho Response, and we approve. This means we’re winning, and we approve of that as well. Maintain, people, maintain,…we don’t want nobody going to jail. Go read the rest, it's pretty fun. Ed Kaitz at the American Thinker has an especially brilliant piece today. He bases the analysis on John Locke and his Second Treatise and is the best explanation for what is going on now. The reason that I picked the title for this post is that Locke was saying that since the power of government comes from the people, the government is the only one that can "rebel." and boy, is our government revolting at the moment. Those "being the likeliest" to destroy the social contract and deliver society back into a state of war are "they who are in power" (i.e. politicians). The reason, says Locke, is that politicians, much more than the people, will succumb to three weaknesses: "the pretense they have to authority, the temptation of force they have in their hands, and the flattery of those about them." People, in other words, naturally choose to set up a limited, divided government that protects private property in order to give the society the best chance at flourishing. Left alone, says Locke, the people have the best chance at self-preservation. Our politician-servants however who succumb to the authority, power, and flattery characteristic of political life will begin to pollute the original laissez-faire system set up to reward the rational and the industrious. Locke's most famous American protégé and a genuine constitutional scholar, James Madison, argued at the end of his brilliant Federalist #10 that there were three "wicked projects" that -- in the hands an unscrupulous political faction -- could potentially inflame our Republic with a most devastating plague: "a rage for paper money, [an] abolition of debts, [and] an equal division of property." In other words, deficit spending, bailouts, and welfare state socialism -- the three pillars of the modern Democratic Party -- were, to Madison, the likeliest and most "wicked" threats to America's self-preservation. For Madison and Locke then, some form of economic and political terrorism would eventually destroy the Enlightenment experiment in constitutional government. You really do need to read the whole thing. This small group of terrorists have made it impossible to spend any money. Biden says that like it's a bad thing. What he should have said, is that they have tried to make it impossible to spend money we don't have. Sheesh, and people think Sarah Palin shouldn't have been VP. Idiots.